(CBT) is an effective combination of talk therapy and behavioral therapy where individuals work with a therapist to find the source of negative thinking and transform those thoughts into a positive, growth mindset. The ultimate goal of CBT is to replace negative thoughts and actions with productive behaviors that make the individual feel equipped to overcome any difficult moment. This interactive training will include videos, role plays, direct instruction, and community resources. This course is designed for individuals working towards licensure of MFT, LCSW, LPCC. Participants will be able to identify the core tenets of CBT; relationship between thoughts, feelings and actions, Cognitive Triangle, identification of common thinking errors and corresponding strategies to address them. 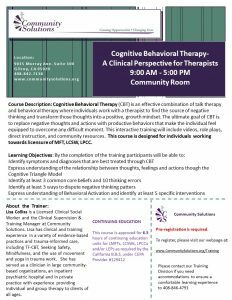 Participants will receive free resources and practice utilizing CBT interventions.